Norwalk, CA–On Friday, March 27, thirty-three educators from 17 regional colleges gathered at Cerritos College to learn about efforts made to establish and sustain the Cerritos Center for Teaching Excellence (CTX). The well-attended event afforded participants an opportunity to take a tour of the CTX and to hear about lessons learned from lead presenter and host for the day’s event, Professor of Music David Betancourt. The event was well-received by those in attendance, with interest in a follow-up event in the 2015-2016 school year. Participants enjoyed the opportunity to discuss issues related to professional learning and campus culture, and the need for sustained professional learning to support student success. 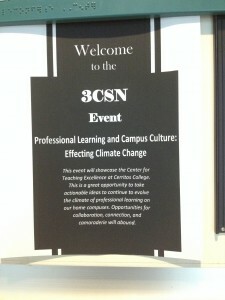 For more information about this and other 3CSN events, please contact Danny Pittaway (danny@3csn.org).